Reading about the vastness of this place has intrigued me ever since since I entered the importing and private label products game on Amazon, and I’m very glad I finally got the chance to attend. For those of you who aren’t familiar with it, The Canton Fair is a convention held every spring and autumn in Guangzhou, China. 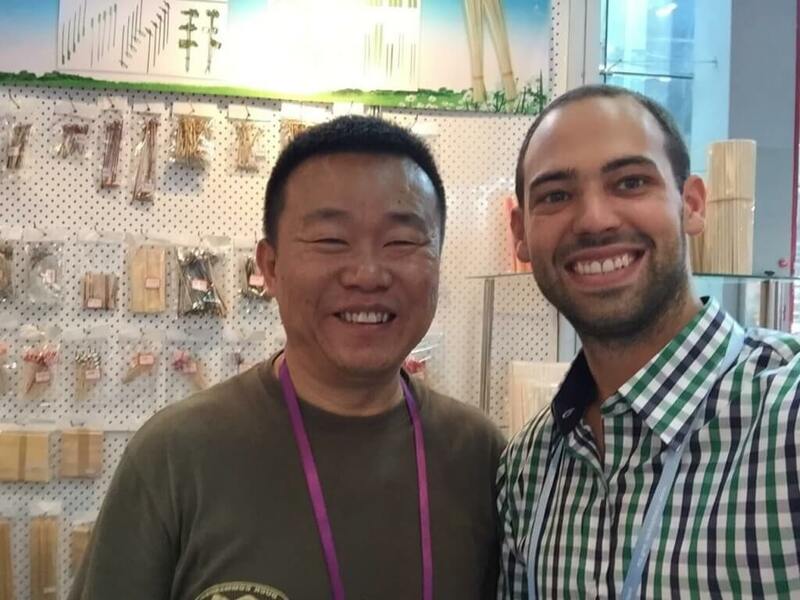 It’s where literally thousands of Chinese factories meet to showcase their products and find buyers. I stayed at the Westin down the road which had a shuttle to the fair grounds. We were able to get buyer badges by showing our passport and visas in the lobby of the hotel so we didn’t have to wait in line at the convention center. The whole process was pretty painless. Overall I was pretty impressed with Guangzhou. I’ve visited a lot of large cities in SE Asia and Guangzhou is overall very pleasant. The infrastructure here is better than anywhere else I’ve been in SE Asia and I would say is on similar standards to western cities. The roads weren’t very congested, no motorbikes weaving in and out of traffic and everywhere seemed to have nice, clean sidewalks. All the vehicles even obeyed the traffic laws (vast difference from a lot of Asian cities). The air is definitely polluted but tolerable and the language barrier is tough. I heard about the communications troubles before I went, however, wrongly assumed it would be similar to Bangkok or Kuala Lumpur. This was not the case. Besides the people working in the hospitality industry, most people cannot speak a word of English. This makes it pretty tough to order food at the restaurants or tell a taxi driver where you need to go if you’re like me and cannot speak a word of Cantonese or Mandarin. Learn EVERYTHING about sourcing products and forming business relationships with suppliers in our FREE eBook! Overall, we made it work; dropping a pin on google maps on your phone can get you where you need to go in a cab. I mostly have eaten at restaurants with pictures on the menu, so pointing works there. At the actual Canton Fair, however, every booth I visited either had an English speaking sales person or a translator. I didn’t see a need to bring your own translator there. Before I went, I heard it was large, however I couldn’t really grasp it until I got there. How big is it? Honestly, I’m still not really sure because I’ve only been there 2 days so far and haven’t see most of it. I did log in 4.8 miles on my phone app the first day of walking around though. There are thousands of booths, multiple buildings with 2-4 stories in each building and a bazillion people. If you don’t have a mission going in there you would just be lost. Its really like a real life Alibaba with everything you could ever imagine in there. There are three phases, each lasting a few days. Between each phase, the entire group of buildings empty out and new manufacturers move in. Different phases feature different categories of products. The days were over 80 degrees and the open doors into the buildings left everyone a little sweaty. Jeans, tshirts and comfortable shoes were the uniform of the day, for buyers and sellers alike. Inside of the partially air conditioned buildings, you see a bunch of rows of booths like this. Each booth represents a different factory, each of which make different products. One booth might have Halloween candy baskets, the next one could have colored duct tape, and two rows down you might find a knock-off Barbie flying on a drone. Anyway, I had a mission. 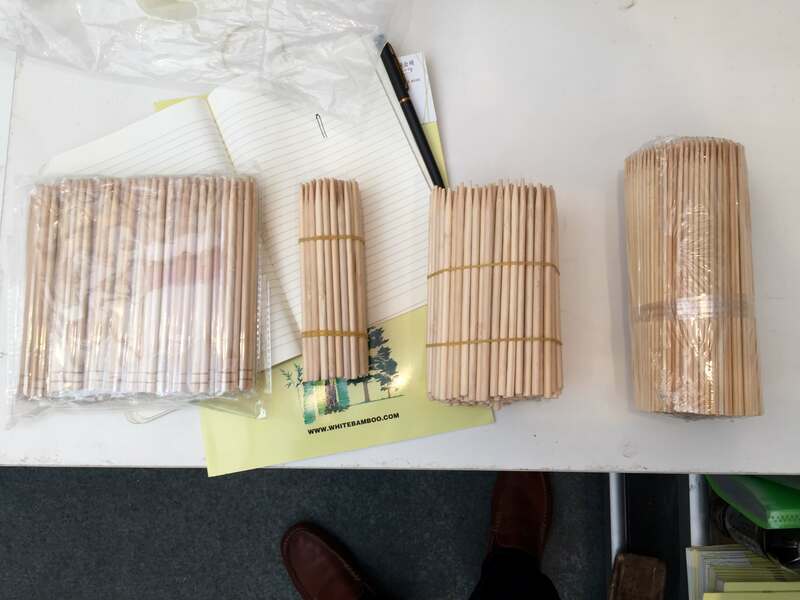 For those of you that have been following along with our collaborative product launch, we chose to sell bamboo marshmallow sticks the week earlier and I was looking for a supplier. 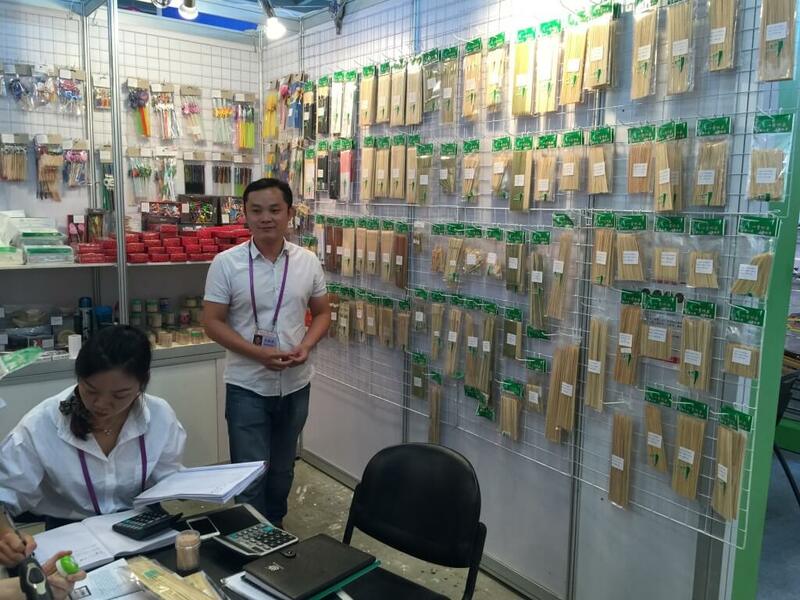 I looked up Bamboo factories in the Canton Fair app before I went and had 4 booths in mind. Each of the booths were in separate buildings and a 10 min or so walk from each other. The first booth I found was this one. As you can see, they have TONS of bamboo stuff. From chop sticks, bamboo forks, sushi mats, skewers to everything in between. I quickly met Jonathan Wu. Wu is a salesman for this factory. Jonathan spoke EXCELLENT English and had good answers to all my questions. 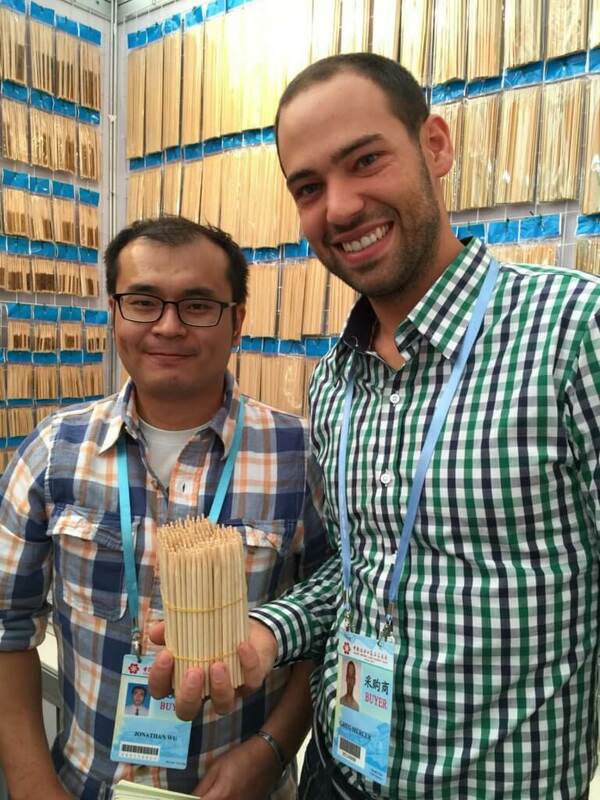 He showed me different grades of bamboo, different thicknesses and the different type of points. It was pretty cool because what usually would take me 5 emails, I was able to find out in about 3 minutes. I also found out that their point grinding machine couldn’t fit lengths longer than 35cm so they would have to manually grind each point on our marshmallow sticks (possible QC problem). I asked him about packaging options and he recommended plastic wrap because this is what they normally do. I really wanted some type of eco friendly packaging, however, he didn’t have any recommendations for this. 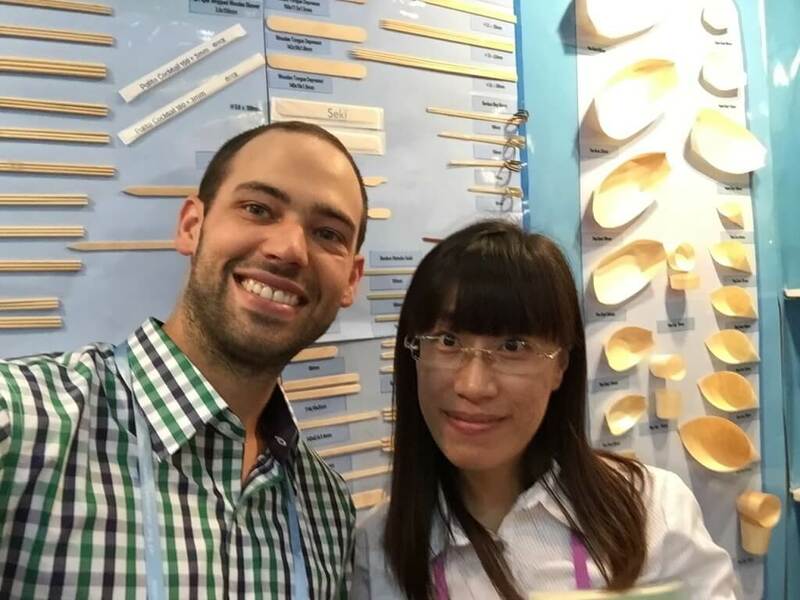 Jonathan didn’t have pricing for me on the spot because he said he had never sold sticks as long as I was looking for (90cm or about 36″) so would have to email me. We exchanged business cards then I went on to find the next booth. I walked 15 minutes with multiple moving sidewalks, a few escalators and some flights of stairs to find this booth. Only to find out that they didn’t have the right setup to produce bamboo sticks as long as I was looking for. They mostly just did chop stick lengths of bamboo. They didn’t seem too interested in working with me or trying to make it work so I moved on. In order to preserve our Millennial’s reputation as being narcissistic, I went on to take selfies with two more sales reps from two more factories. Both of these factories were more than happy to work with me and my specifications. They both showed a few different types of wood they could use (I still want bamboo), some of the different points, bamboo grades, etc. One of the factories proudly showed me their colored sticks, which used some type of dye, however, I didn’t trust that for our item since it will come in contact with food. As an added bonus to taking selfies to document my journey, I also plan on using these pictures in emails to follow up with these sales reps. I can now say something along the lines of…. 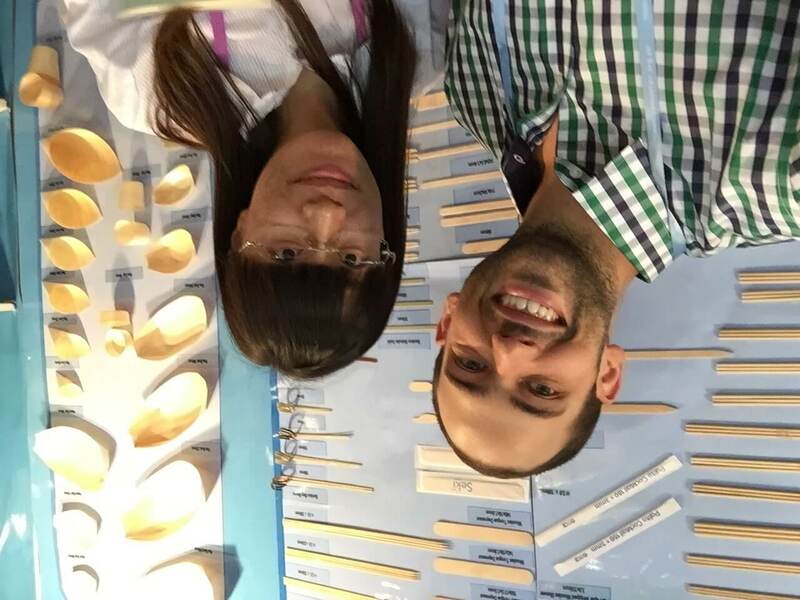 “I enjoyed speaking with you at the Canton Fair, I’m looking forward to your price quote” and attach the picture to the email. They will likely have tons of emails for days after the Canton Fair so this helps me stand out of the crowd a little and let them know I’m serious. I went on to give all of the sales reps my contact information (email) and asked them to get me quotes ASAP. So far, 3 days have gone by and I haven’t heard from a single one yet. I guess its time to whip out those selfies and follow up with them. Were you at the Canton Fair? If so, leave your experience in the comments below. Start selling with Jungle Scout today! 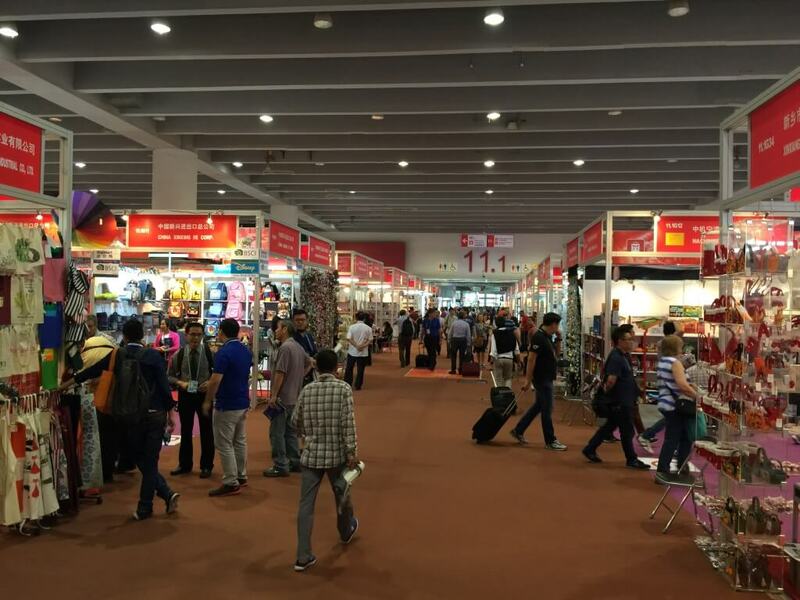 Do you go to Canton Fair every year ? I’m Alex, currently living in Ukraine an working on my first PL products (though i have had quite an experience importing and trading in Ukraine). 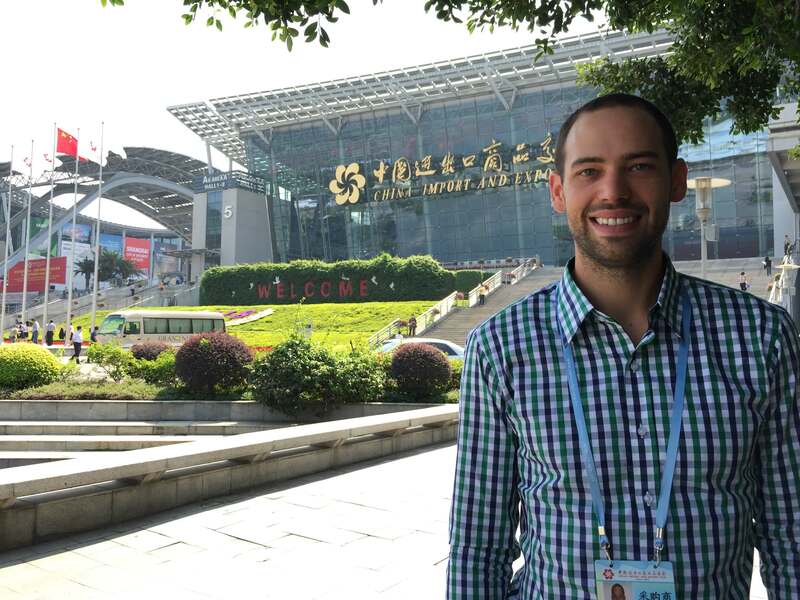 1) Where can i see your webinar on Canton Fair? Can i have a link or smth? 2) Which fair (HongKong Global Sources or Canton) do you believe to be be better in sense of finding some new potentials? If you occur to come to Ukraine, i’d be more than glad to meet and sightsee you. I recently attended your webinar (the one with Mark Scott Adams) about Canton Fair, it was very interesting, even if I had to stay awake at 1am in Valencia, Spain. I find it fun today to read this article about your first time there… You’ve come a long way since this first visit. You told that you’ve been to Canton fair 3 times so far, right ? Honestly, I knew that China regularly hosts this kind of fair but your webinar really made me want to attend. I’m getting married in July so it seems complicated to go to Canton in April. But I guess I still can plan this trip for the autumn. Are there big differences between the fair of April and October or are they absolutely the same ? By the way, I’m a french entrepreneur living in Spain and traveling a lot. I’m working on my own affiliate websites for more than 4 years (20+ websites), and selling PL products on Amazon for 15 months now (5-6 different products). Be sure you’re more than welcome if you ever come to France or Spain ! Good luck with your next projects and keep up the good work ! Thanks Remi! I think the October canton fair is supposed to be a little bigger, however, they’re both enormous! Glad you’re enjoying the webinars/blog posts 🙂 I be sure to give you a shout next time I’m in France or Spain. Cheers! It would be nice if you could offer your webinars at an alternative time – like GMT for us in the UK. I have missed all your webinars so far coz they are transmitted live in the very early hours of the morning! Thanks for the feedback. We’re going to try and start alternating times to accommodate our international crowd better. If you were to have found what you wanted and after touching it pulling it and dropping it – could you have ordered a 1,000 or more on site and arrange payment for a projected arrival direct to FBA Amazon after sending them ASIN codes etc for each box or would you have them sent to your warehouse for processing before sending to Amazon? I’m not sure I fully understand your question. 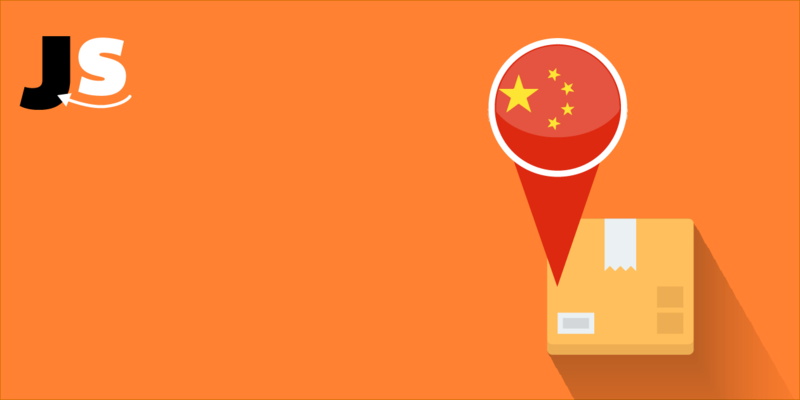 Yes, you can ship directly to the Amazon DC’s, however, the canton fair and other trade shows are set up to create relationships and find factories, not really to place orders. Normally, you would find a factory/sales rep then communicate after the show to place an order.